New York, Nov 21 : The Duke and Duchess of Cambridge have told the reporters, who have applied to cover their visit, to follow a proper dress code. According to the edict, journalist wishing to cover royal engagements, whether in the United Kingdom or abroad, should comply with the dress code on formal occasions out of respect for the guests of the queen, or any other member of the royal family, the New York Daily News reported. The warning told reporters to show some respect and that smart attire for men includes the wearing of a jacket and tie, while for women a trouser or skirt suit." 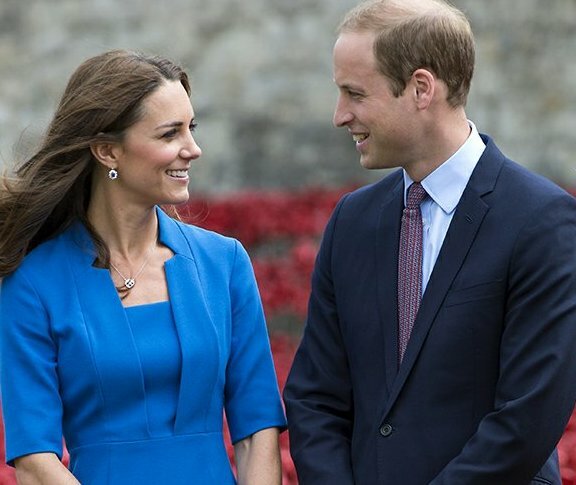 London, Sept 14 : Duchess Kate and Prince William were keen on their mirroring their own childhoods and always planned on keeping their children close in age, it has been revealed. According to sources, Kate's only a year older than Pippa. William is Harry's elder by just two years and the Royal couple always planned their own family on the same lines, the Mirror reported. The 32-year-old, who believes her continuing close relationship with sister Pippa is down to the fact that they were born just a year apart, hopes her first son George, now 13 months, and the new baby will have the same strong bond that she has with her own sister. London, August 28 : Matt Le Blanc has revealed that Prince William and Prince Harry are keen to see ' Friends' reunite. During an interview with Glamour. com, the 47-year-old American actor, who played Joey Tribbiani on the show, said that the two sons of Prince Charles admitted that they are big fans of the US sitcom and are keen to see the stars reunite after 10-years, the Mirror reported. London, June 26 : The refurbishing cost of Kensington Palace, where Prince William and Kate are residing, costs 4.5million pounds. According to accounts, 4.5million pounds of taxpayers money has been spent on refurbishing the 20-room Palace apartment, which is 16 times the cost of the average UK home, the Mirror reported. Sir Alan Reid, Keeper of the Privy Purse said that the money has been spent on structural work and bringing rooms up to "basic living standard" for them and baby Prince George. London, May 30, : Prince William has been crowned the most fashionable celebrity offspring after beating Beyonce and Jayz’s daughter Blue Ivy to the top of a new poll. The third-in-line to the British throne, whose mother is Catherine, Duchess of Cambridge, has won 23 percent of the public vote on baby website My1stYears. com, with Blue Ivy coming in second place, the Express reported Thursday. Newlyweds Kanye West and Kim Kardashian's baby girl North is third, with singer Alesha Dixon's daughter Azura and David and Victoria Beckham's tot Harper rounding out the top five. London, Apr 20 : Martin Freeman has revealed that Prince William was hooked to movies like 'Hobbit' and ' Lord of the Rings' and the classic -stories that inspired them. The ' Hobbit' star who met the Duke of Cambridge at the premier of the first film of the trilogy asserted that he was a nice guy and he was the biggest royal fan and they had fans everywhere as it was a very beloved book, the Mirror reported. The 42-year-old actor said that the Duke wanted to be there at premiere as his wife was in hospital at the time. Sydney, April 15 : Australian cricket legend Glenn McGrath and woman all-rounder Ellyse Perry will meet Prince William and Kate Middleton Wednesday in a special event at the Sydney Opera House here when the 2015 ICC World Cup and participating nations will be showcased. The event will highlight the diversity of cricket as the royal couple will be greeted by children from the 14 participating nations and presented special indigenously painted cricket bats along with a baby 'baggy green' for their son Prince George. London, April 7 : Britain's Prince William Monday began a three-week tour to New Zealand and Australia with wife Kate Middleton and son Prince George. The royals stepped off their special aircraft at the Military Terminal at Wellington Airport Monday morning, to begin their highly anticipated trip in New Zealand and Australia, reports www. eonline. com. The Duchess of Cambridge carried the adorable eight-month-old on her hip and the Duke of Cambridge waved as the family disembarked from the Royal New Zealand Air Force aircraft. London, Nov 27 : Singer Taylor Swift considers herself lucky that she got to meet Prince William and says he is very funny. "He was very funny. I was really happy he was funny," contactmusic. com quoted Swift as saying. The 23-year-old singer performed here at the annual Winter Whites Gala at Kensington Palace Tuesday, in aid of youth homelessness charity Centrepoint. William and his wife, Duchess Catherine, are the current Patron of Centrepoint, the leading charity in Britain supporting homeless young people aged 16-25 years. London, Oct 24 : Prince George, son of Prince William and Duchess Catherine, was christened at the St. James's Palace Wednesday. He was baptised by the Archbishop of Canterbury, while the Queen, the Duke of Edinburgh, Prince Charles and his wife Camilla, Prince Harry as well as Kate's family gathered for the private ceremony at the Chapel Royal, Xinhua reported. Also present at the event were seven godparents of the newborn, including one being Prince William's cousin and the rest all friends of the royal couple. New Delhi, March 26 : Wax statues of the Duchess of Cambridge and her husband Duke of Cambridge have joined Madame Tussauds museum in Hong Kong. The wax statues of royal family members displayed at the museum sees Kate Middleton dressed in a graceful black lace gown and Prince William in a black tuxedo. The statues have now begun their world tour. London, Jan 15 : William and Kate's baby could be born on grandma Princess Diana's birthday and even be named after her, it has been revealed. Buckingham Palace yesterday announced that the couple's first child is due in July. Diana came into the world on July 1, 1961, the Mirror reported. Officials also announced that Kate was continuing to feel better following the terrible morning sickness that forced her into hospital in early December. She has had her 12-week scan and is believed to be around 13 or 14 weeks pregnant. London, Jan 14 : Prince William is not a regular churchgoer despite being the future "Defender of the Faith" and "Supreme Governor of the Church of England", the Daily Mail reported. Although the 30-year-old future king was confirmed into the Anglican faith in 1997, he is understood to attend services of worship only a handful of times each year. Most of these are connected with official engagements or on special occasions in the calendar such as Christmas, as well as weddings and christenings. According to a statement from St James's Palace, the Duke and Duchess of Cambridge are saddened to hear about the death of Indian-born nurse, Jacintha Saldanha. "Their Royal Highnesses were looked after so wonderfully well at all times by everybody at King Edward VII Hospital, and their thoughts and prayers are with Jacintha Saldanha's family, friends and colleagues at this very sad time," the statement read.